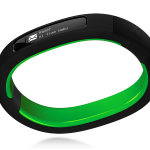 The Razer Nabu is an upcoming fitness band from the traditional game peripheral maker (they are well known for their line of PC gaming products and peripherals). The Nabu will include a bevy of fitness tracking features such as distance traveled, calories burned, active minutes and sleep times. It also includes basic smartwatch functionality in that it can display notifications and alerts from a connected smartphone. The most unique feature is the social sharing functionality, which allows two Nabu wearers to quickly swap contact info and social accounts through physical gestures, like a high-five.